Let me start by saying that I love to travel around the world. Japan, Belgium, France, Costa Rica and soon to be Israel to study Krav Maga. With all the information and technology available at your fingertips you would think that you could sit on your couch and absorb the world’s best knowledge. But not so. And that is why you must get out and travel, to find those little tips, tricks and methods that other people utilize to improve on life. If you have never visited Japan, I highly recommended. It will show you just how small the United States is when it comes to traffic management, customer services and safety. Risk and safety managers are always looking to reduce incidents, the good managers anyway. We as an industry have tried all types of schemes to reduce injuries, some good, some bad, some silly and some downright mean and nasty. From incentives to discipline, job rotation, task reduction, ppe, substitution, elimination, checklists and many more. All without much of an impact I might add. 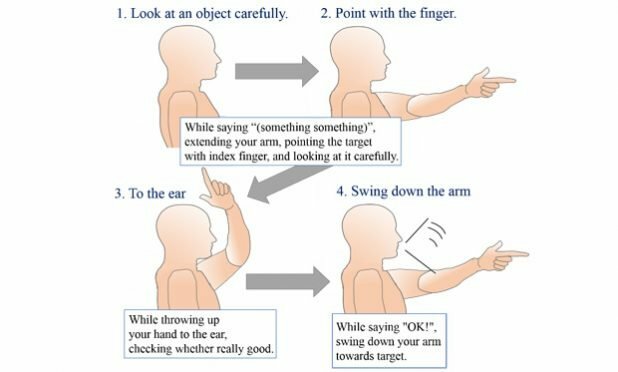 Pointing and calling (P&C) is a technique that was, dare I say, invented in Japan in the railway industry. The concept was to reduce accidents due to failure to see things right in front of them while not actually focusing on them. The idea is that there are 5 senses available to the human, but three of them are key. Touch, sight and hearing. We all see things but that doesn’t help us reduce accidents. By adding the tactile and verbal (touch and hearing) we are activating more areas of our brain and waking it out of its stupor. We have to see and think that the safety button is depressed, but adding touch (pointing) we have to activate the brain to lift up the arm and press the button or point to the button. Adding verbal statements to the mix means we have to formulate the words into sounds and say them out loud also activating our hearing of those words. All-in-all it gets the juices flowing. Things like brainstorming, contemplation and general thinking-only tasks don’t require P&C. Tasks such as lockout tagout, operating machines, forklifts, confined spaces, fall protection are all great areas for P&C. Start slow and practice in the lab (classroom) before implementing P&C in the field. For help implementing P&C give us a call. Next Face paints – what are the risks?